When I was in Paris a couple of weeks ago, one night my friend and I were eating out in a nice wee bistro. Because we’re adventurous, we chose starters at random, just picking something from the menu without bothering to translate or ask what it was. I actually really wanted the ratatouille, but I didn’t want to seem like a coward to my mate, so I did what she did, and got something unknown. 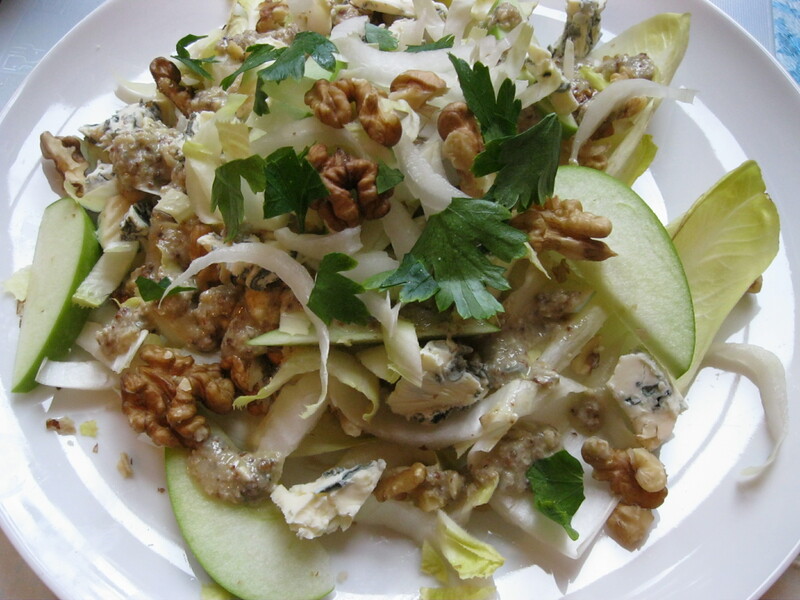 I got pretty lucky: I’d chosen a pretty innocent salad of chicory and blue cheese. My friend, however, wasn’t quite so fortunate. She got a plate of seemingly innocuous cold meat, which turned out to be some God-awful creation from Hell full of hard chunks and sour bits. She hated it. It looked pretty decent (like slices of sausage, I’d say a cross between very chunky mortadella and smoked sausage, sort of) so I offered to swap with her, because I’m usually not too fussed, and I was hoping to make her happy . However, as I took the first bite, I realised that I had made a grave mistake. I was too polite to say anything. A swap is a swap, there was no going back. I smiled and said: “Hmmm, you keep the salad, I don’t mind this at all”, whilst considering to ‘accidentally’ pour water next to my glass and onto my plate, thus making the unidentified compressed animal inedible. It seemed tricky to pull off such an incredible stupidity without passing for a drunk or an idiot. I kept eating, masking the horrifying feeling of crunchy bits with lots of bread. But then a miracle saved me. I had worked my way through about half of the dish, when I came upon two eyelashes that were most certainly not mine. With them, I had found an excuse to reject the remainders of this horror, without letting my friend know my true feelings regarding our unfortunate exchange. I relaxed, drank some more wine, and waited for my delicious main. Everything went better than expected. When I got back home, I got out a dictionary to look up this dish, museau de boeuf. The shock upon finding the translation was a nasty one: cow’s muzzle. I had unwittingly eaten a nose. 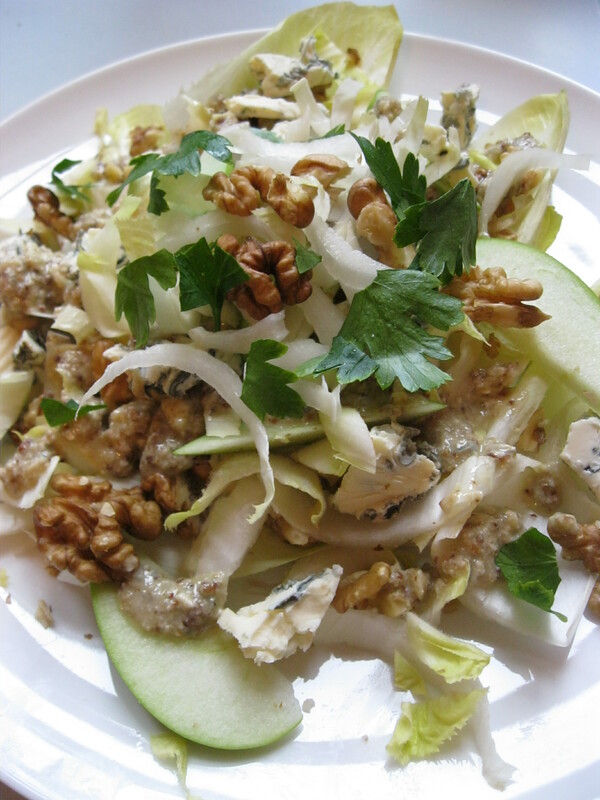 I knew I should have stuck with my chicory and blue cheese salad. First make the dressing. Chuck about 6 walnut halves in a jug or large mug, then add mustard, oil, vinegar. Grind it all up with a hand blender. Then take about 25 gr of cheese and stick this in as well, mix up again. I realise the colour doesn’t look very appetising but it’s delicious, trust me. If the dressing seems too thick, add more oil and/or vinegar, but don’t exaggerate, it’s OK if it’s a bit thick. Now slice up the chicory. In the pictures there’s some whole leaves, but that’s only to show you people that it’s really chicory and to make it look tastier. It’s actually a lot more practical to slice everything up into strips of about 2 cm. But do it as you please. 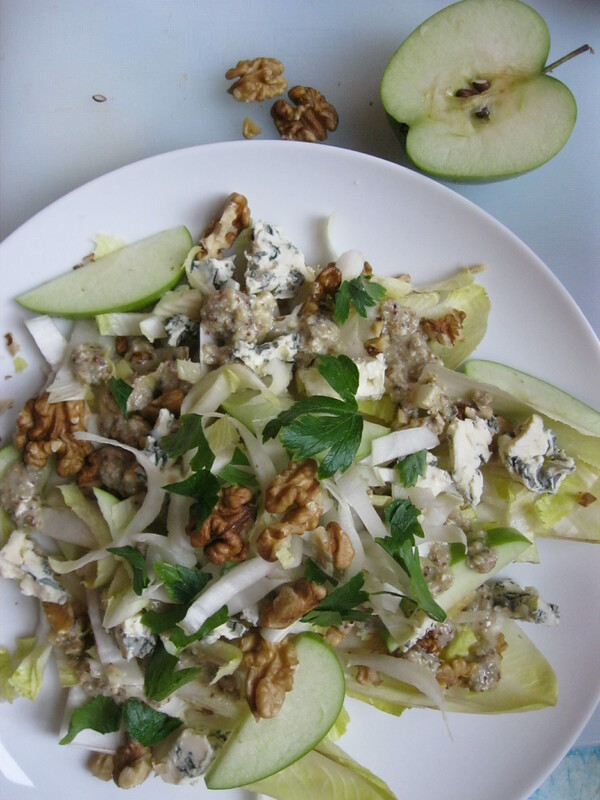 Slice a granny smith in half, then slice quarters out of one of those halves, remove the core and slice it up further, add to the chicory. Break the walnut halves in slightly smaller pieces. Mix with the chicory. Use as much cheese as you like, cut or torn into little bite sized chunks and add to the salad. Now top it all with the vinaigrette you’ve just made and some flat-leaf parsley. This entry was posted in Food, Travel, Vegetarian and tagged cooking, foodporn, museau de boeuf, Paris, salad. Bookmark the permalink. Wat een mooi en fraai geformuleerd verhaal. Ik heb hardop lachend zitten lezen. Ik wil ook eens museau de boeu eten. Binnenkort wellicht in Sint Omaar. Of zal ik Helmut of Dorine erin luizen? Ik heb hoe dan ook al genoten. don’t live without roquefort! it can be found in many places in scotland: in glasgow, edinburgh and aberdeen you will find it in peckham’s and mellis. also in glasgow; george mewes on byres road, along with many other exciting cheeses. Ah that’s brilliant, thanks a lot! I suspected it was probably not too difficult to come by in the West End, but sometimes if I can’t get it in the shops right close to my house I just can’t be bothered. It’s pretty good with Saint Agur anyway, although next time I’ll probably walk the extra half mile. Cheers again!